All services are at 2.30pm. 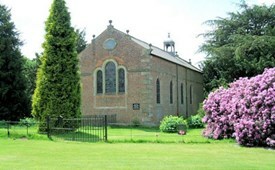 All Saints Chapel, Somerford was built in 1725 as a domestic chapel to Somerford Hall by Peter Shackerley. Since 1943 it has been a chapel of ease. The hall, other than one wing and the stables, has been demolished. The chapel is built in chequer brick in four bays. All the corners have chamfered quoins. On the west face is a central doorway above which is a rectangular datestone. Above this is a round-arched window and a clock face. On the summit of the gable are ball finials. The eastern face has a three-light window above which is an oval oeil de boeuf window and finials similar to those on the west face. The north and south faces have four round-arched windows with ashlar surrounds. Internally the lower parts of the walls are panelled. On top of the panels is a 19th century frieze and cornice. At the western end of the chapel is a gallery which is supported by Corinthian columns and on the left of the gallery is an enclosed pew. At the eastern end of the chapel is a reredos with three painted panels. The left panel has an extract from St Matthew's Gospel and the right panel has the Creed. The central panel is overlaid by a 20th century panel of embroidery. The east window was replaced in 1919 with a memorial window to three members of the Shakerley family who died in the First World War. On the north side of the altar is a 17th century memorial to Elizabeth Shakerley who died in 1691. Internally the lower parts of the walls are panelled. On top of the panels is a 19th century friezeand cornice. At the western end of the chapel is a gallery which is supported by Corinthian columns and on the left of the gallery is an enclosed pew. At the eastern end of the chapel is a reredos with three painted panels. The left panel has an extract from St Matthew's Gospel and the right panel has the Creed. The central panel is overlaid by a 20th century panel of embroidery. The east window was replaced in 1919 with a memorial window to three members of the Shakerley family who died in the First World War. On the north side of the altar is a 17th century memorial to Elizabeth Shakerley who died in 1691. In the churchyard is the grave of Peter Shakerley, founder of the chapel, who died in 1726. All services at All Saint’s Chapel are at 2.30pm.